Sometimes you see something that resonates with you so intensely that you can't let it go. 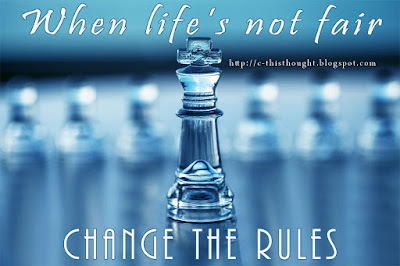 When life's not fair, change the rules. I thought it was cute, hummed a little tune to it and let it go. 7 hours later, I needed it. I was angry and frustrated and looked for something to break the pattern I was in. I opened up my armoire and as my eyes landed on my Unicorn Angel Card Deck, the phrase came back. I chanted it for a good thirty minutes. Within 1 minute, my frequency had zapped up to where I love it to be. Within 30, I felt higher than a kite. Find the things that resonate within and use them.